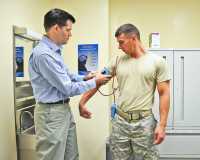 Why Don’t Younger Men Get Health Check Ups? Response: Gender based preventative health has been of interest to medical community since 1900’s with health disparities between males and females being of particular interest. United States founded National Research Institutes for female health in 1900. This led to comprehensive and systematic medical services being offered which have improved female health care significantly. Similar research programs and initiatives to improve men’s health were started only in 2000 (1). Cultural depiction of men being fearless and based on perception of masculinity leads them to underutilize the preventative health care screenings available to them or sometimes even delay care when they need it the most. Males have been found to have higher mortality rates compared to females. My research study adopted the basic survey design and conducted an anonymous survey throughout United States with men aged 18 to 40 being the participants. Our goal was to identify these gaps, analyze the reasons for underutilization and identify opportunities to improve preventative care guidelines among the male population. The main findings were almost similar to the BFRSS data obtained by CDC in the year 2016. Response: Having good health and better quality of life is equally important in our lives with growth in our careers. Few people are blessed with good genes and fewer risk factors. But most of us need to work hard to be healthy, make better choices of food and do regular physical activities. All of us need to invest our time and understand our health better. One of the ways to do this is with annual physical exam every year. Make use of preventative health care available to you, educate yourselves about maintaining and sustaining a better quality of life. Let’s start now! Response: Funding, health policies and guidelines for interventions are divided and different for females and males. Males are physically very different from females, but preventative physical and mental health care guidelines should be same for both sexes. This will lead to better formulations, better implementation and success to these interventions. Health care budgets can be managed in a better way. Communities can come forward to fund these preventative health care screenings. This may lead to better participation and better utilization of these screenings due to better communication among people living in the same community. Huge tech companies have taken a step ahead to maintain better health of their employees with yearly health screenings available to them at no cost. Smaller companies, non-profit companies, subsidiary companies, local produce companies all should consider the health of their employees and provide them with yearly preventative health screenings, vaccinations and health check-ups. In fact, these measures will help the companies to have better growth pattern and better quality of life for their employees. Response: I don’t have any financial, commercial or personal disclosures to make. My research study is free of commercial, financial and personal gain. This entry was posted in Author Interviews, Gender Differences, Lifestyle & Health and tagged APHA18, Gender Differences, men's health by Marie Benz MD FAAD. Bookmark the permalink.